*AS NOTED IN PREVIOUS BLOG POSTS I AM NOT A VETERINARIAN OR DOCTOR OF ANY SORT. **I AM A COLLEGE DEGREE HOLDING PET OWNER THAT BELIEVES ALL PET PARENTS NEED TO BE PROACTIVE, DO THEIR RESEARCH, FOLLOW THEIR INSTINCT AND ADVOCATE FOR THEIR PETS. IF IN SHARING OUR EXPERIENCES AND LEO’S STORY WE CAN HELP OTHER FAMILIES IT WILL MAKE US FEEL LIKE WE CONTRIBUTED TO THE WELLBEING OF THE PETS AND THEIR LOVING FAMILIES. As most of you know Leo had an anterior luxation that caused acute glaucoma and had to have an eye removed in May of 2013. In October of 2013 we noticed some symptoms in Leo that lead us to believe he may have Cushing’s Disease. Symptoms at the time included: weight gain in belly, fur loss on lower back region, panting and a slight increase in water intact. We took Leo to the vet and expressed our concern stating that we thought he may have Cushings and requesting he be tested for it. At this point in time that vet told us that the symptoms Leo was experiencing were common signs of a thyroid issue. They tested his thyroid and told us it was low at which point he was put on Soloxine. A few months later we took him back in to the vet for bloodwork to see how his levels were and Leo was diagnosed with a non-specific liver and kidney issue as a couple of his liver enzymes were elevated and he had 3+ proteins in his urine. Leo was then put on Denamarin to assist with liver function. More time passed and bloodwork was done two more times by this vet, both times Leo still had elevated liver enzymes and protein in his urine. Finally, we were able to talk them into testing for Cushing’s Disease as Leo had an increase in Cushing’s symptoms. They ran the test and it came back negative for Cushing’s Disease. We then continued to monitor Leo’s liver and kidney function with no definitive answers as to what was going on, what was causing the issue or how to effectively treat the issues. At our final visit with this vet they diagnosed Leo with high blood pressure and attempted to put him on medication for that…at this moment I decided to follow my gut and seek a second opinion from a holistic vet in our area. Upon meeting the holistic vet and having him examine Leo and go over all of his records he noted that Leo’s thyroid was fine and that he did not need to be on the thyroid medication Soloxine in the first place. When testing the thyroid there are three numbers that come back, many vets only focus on one of the numbers, but all three numbers need to be taken into consideration. Our new holistic vet explained that thyroid issues are often times over-diagnosed in dogs. At this point in time we decided to take Leo off of the Soloxine as he didn’t need to be on it in the first place and it was what was probably causing the increase in blood pressure for Leo. A month and a half after taking Leo off of the Soloxine we took him in to run blood tests and check his blood pressure. Leo’s blood pressure was perfect! Leo’s thyroid was perfect! A couple of Leo’s liver enzymes were elevated and Leo did still have protein in his urine. We put Leo on some Chinese herbs to help with liver function and decided to do more bloodwork the following month. The next set of bloodwork came back with Leo still having increased levels of liver enzymes and protein in his urine, Leo also had increased calcium levels. At this point with all of the bloodwork results all of the signs were pointing towards Leo either having lymphoma or Cushing’s. I apologize for the length of the following email, but also know that typically I am better at explaining things in writing than I am verbally…so it is a bit of a read, but I feel there are some good points. Goal is for Leo to be as healthy and happy for as long as possible. I know that there is a chance that Leo has lymphoma, but looking at all of his symptoms, etc. I feel that he probably has Cushing’s Disease. • Increased thirst and urination (which can lead to the symptom of incontinence): When monitoring Leo he does drink significantly more than our other two dogs. During daytime hours they drink nearly the same amount, but Leo is up at least three times every night drinking water. Leo also requests to go outside far more often than the other two dogs. We have been lucky thus far and not had any incontinence issues. • Increased panting: When first bringing up the concern of Leo possibly having Cushing’s with old vet I did inform them that Leo was panting much more than normal. Leo, at that time, could sit and just pant, even with no physical activity prior. Leo is currently not doing this anymore. • Weight gain in the abdominal area, in spite of a reduction in calories (pot belly): The main symptom noticed with Leo, other than hair loss, was that he was getting or had a Buddha belly that was mainly noticeable when he was sitting, but was also quite noticeable when he was standing (he appeared almost pregnant). • Thinning skin and change in the pigment of skin, from pink to grey or even black; bruising: Leo’s skin does appear to be thinning, especially in the belly and neck area. Leo’s skin pigmentation has also changed in his ears turning to the greyish black color. • Hair loss and dullness of hair: Leo has significant hair loss on his lower back. Leo has also lost much of the sheen of his coat. • Irritability or restlessness: We’ve not seen much irritability out of Leo as he is typically very good natured. We have noticed a lot of restlessness. • Increased hunger: No increase in hunger noted. • Seems very tired and inactive: Leo does at times seem very tired, but still has a great amount of physical activity and enjoys playing. We associated his decrease in activity with an increase in age. • Gets skin infections: Leo is suffering from ear margin dermatosis that he has never had before, this is new to him. • Decreased Muscle and bone mass: Leo’s muscle tone is lacking compared to how it used to be, we just associated this with aging. Much less common are symptoms of rear limb weakness and blood clots. Leo has shown signs of weakness in his rear legs. Old vet noted that he did not immediately move paw back when she curled it under and stated it was “nerve damage.” We have witnessed Leo having episodes of back leg shaking and this has been increasing. Noticed it for the first time about 6 or so months ago. There are times that Leo’s back legs or hind end will shake while he is standing, but this does also occur sometimes when he is in a seated position. • Pituitary dependent. This form is the most common, affecting about 80% to 90% of the animals who have Cushing’s. It happens when there’s a tumor in a pea-sized gland at the base of the brain, called the pituitary. • Adrenal dependent: This type comes from a tumor in one of the glands that sit on top of the kidneys, called adrenal glands. About 15% to 20% of diagnosed dogs will have this type. Soloxine should not be used if your pet has ever had thyrotoxicosis, or an uncontrolled adrenal gland problem. Tell your veterinarian if your pet has heart disease, anemia, diabetes, or problems with the pituitary or adrenal glands. If you give your pet insulin or diabetes medication by mouth, dose adjustments may need to be made. Being that Cushing’s Disease in dogs has two primary types: Pituitary dependent and Adrenal dependent and that the above states that Soloxine should not be used in cases where the animal has issues with pituitary or adrenal glands I question if Leo being on Soloxine when the Cushing’s test was done could have affected the test results. Depending on your opinion I would really like to re-test Leo for Cushing’s Disease, or start to treat him for Cushing’s Disease to see if it would help him. Our holistic vet received this email on Monday November 2 and by Friday the 6th we had Leo in testing him for Cushing’s a second time. As you remember from above the old vet tested him and it came back negative. This time Leo was not on unnecessary medication (Soloxine) that would skew the results. On Monday November 9th we received the call that confirmed that Leo DOES have Cushing’s Disease. Leo has now started Vetoryl, one of the only FDA approved medications to help with Cushing’s…not a cure, but a help. Leo has only taken two doses so far. Now our adventures in diagnosed Cushing’s Disease begins….we will be sharing Leo’s story along the way. **PET PARENTS: PLEASE FOLLOW YOUR GUT. FOLLOW YOUR INSTINCT. GET A SECOND OPINION OR EVEN A THIRD IF NEEDED. DON’T BLINDLY TRUST A DIAGNOSIS IF YOU FEEL LIKE IT COULD BE SOMETHING DIFFERENT. DO YOUR RESEARCH. ASK QUESTIONS. ADVOCATE FOR YOUR PETS–YOU ARE THEIR VOICE!!! 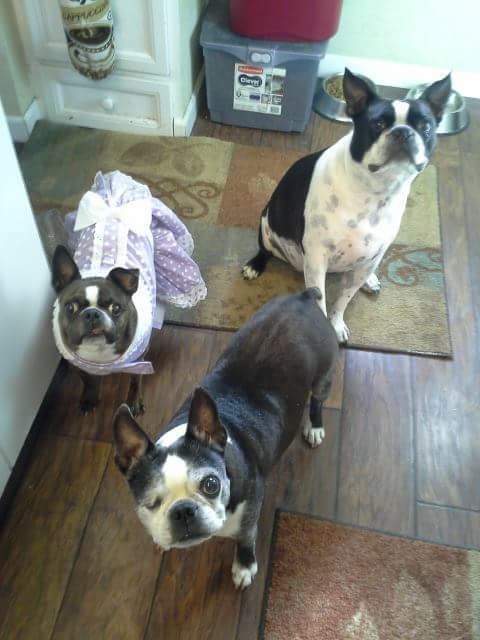 Leo the Boston Terrier with his sister Kuki and brother Doc.